The TPT320 has a robust body that provides a comfortable grip for the user and has an IP64 ingress protection rating. The tester is powered by two replaceable AAA batteries and, as standard, it is supplied with GS38-compliant shrouds for the test probes. To ensure that the TPT320 is fast and convenient to use, it includes both an LED display and an LCD panel. The LED display provides an instant at-a-glance indication of voltage in six steps, plus, in the case of DC voltages, polarity, while the LCD panel provides a three-digit readout of the voltage being checked. The tester also incorporates two red LEDs that light when it is connected to voltages high enough to present a shock hazard, and this feature remains fully functional even if the tester’s batteries are missing or completely discharged. One advantage of the TPT320 is when used for voltage checks on circuits that incorporate an RCD or have RCBO protection, the tester does not cause these to operate and disconnect the supply. While primarily intended as a voltage checker, the TPT320 offers valuable additional functions. These include continuity checking with an acoustic sounder and for three-phase systems, phase rotation indication that does not require crossing of the test probes, which is often necessary with other types of two-pole tester. The TPT320 also includes a bright LED torch to aid safe working in poorly lit environments. 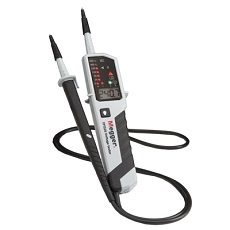 Optional accessories for Megger’s new TPT320 voltage checker include replacement GS38 probe tips, a convenient protective pouch, and the MPU690 battery-operated proving unit which is recommended for use with the tester when confirming that circuits are safely isolated prior to working on them.